My four year old grandson Jr is very creative. One of his favorite things to do is paint pictures on rocks. 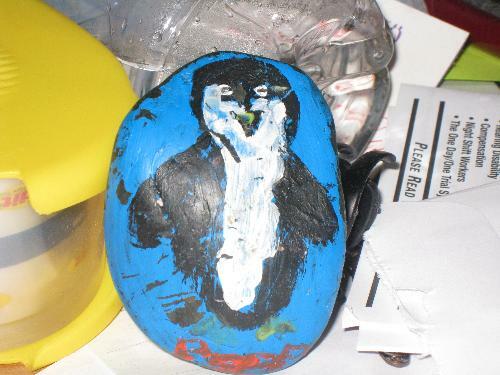 His Auntie Lauren helped him paint a penguin on a rock for me. We named the penguin Peeps 2. Peeps 1 is a stuffed penguin that belongs to Auntie Lauren. Peeps 2 is a very good pet. He stays on my desk and never wanders off except when my 22 month old grandson encourages him to. He is a great pet to have. Oh I think he will be an artist when he grows up, I saw rocks with paintings on them for sale in a rather high up market store a few weeks ago, it was obvious that they pick rocks and are suitable shape of the animal they are painting, they were really beautiful.